Enterprise Tondelli entered the reel or roll fed labeller market in 1996 with the supply of two machines for 16,000 bottles per hour and 20,000 bottles per hour respectively. Since then they have supplied many more in many countries around the world with a range of machines which now includes rotary models from 6 heads upwards. Opportunity to run both paper and plastic labels on the same roll fed labeller machine. Inverter controlled driven reel coupled with a multiple blade rotary drum to cut the label. Transfer is achieved with a vacuum drum that has holding fingers to ensure accurate label positioning. Scanning for the registration mark is continuous, allowing for easy resetting of the machine without having the need for the operator to manually resynchronise. Label change over is also a very simple operation often without changing vacuum drums or cutting blades. The current range of reel red machines gives outputs up to 48,000 bph. On the reel fed label ler platforms, rotation can be adjusted by means of a handwheel rather than the conventional change parts of toothed belt and sprocket. The hand wheel adjustment system allows for quicker change over and almost infinite variation without change parts for new bottles. Units are PLC controlled as standard and now have the possibility not to have a registration mark at all. Hot melt glue units can either be Nordson or Preo dependant on local support in the country. 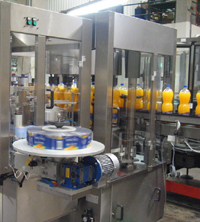 Recent applications have include a 12,000 bottles per hour reel fed plastic labeller with a self adhesive label station as well. This second label application is for the application of a promotional decal for on bottle promotion. The current speed range of the reel fed labellers is from 6,000 bottles per hour to 48,000 bottles per hour.